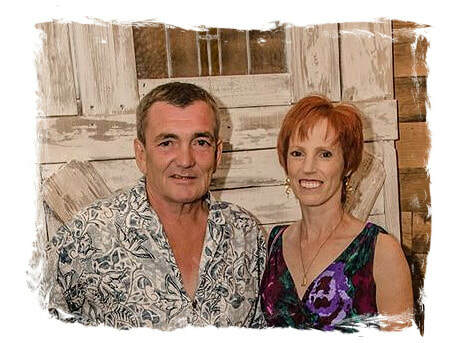 Pallet Man Designs is the collaboration of husband and wife team, Peter and Cindy Campbell. Peter was involved in all aspects of construction throughout his life in Vermont. After moving to Florida in 2009, he decided to create a bench out of pallets. He enjoyed using his creativity and his benches were well received. When he suggested doing a local craft fair to his wife, Cindy, she wholeheartedly agreed. Cindy also grew up in Vermont and throughout her life used both sides of her brain. An accountant by education, numbers and right brain thinking come naturally to her. However, her creativity was always screaming to come out. So, back to that conversation between Peter and Cindy regarding craft fairs. As a craft fair enthusiast, Cindy realized a crafter must offer items at a smaller price point than a bench. “I’ll make some signs”, she suggested. Well, that was the beginning, and how the Pallet Man evolved to being a little more Pallet Woman. ​Pallet Man Designs prides itself on utilizing reclaimed materials. It started with pallets. And then Hurricane Matthew hit central Florida in October 2016. All that free material just piled up on the side of the road! And to think homeowners will even help you load it in your truck to get it off their lawn!